I was seriously impressed with the first novel I read by Scalzi, the book was Old Man's War and the exceptional prose and clever story really won me over; so much so that I picked up Fuzzy Nation soon after - although I haven't had to read that book yet. It was therefore with more than a little joy that I received Redshirts from those good people at Gollancz and I couldn't wait to review such an intriguing book. The story follows the adventures of those titular red shirted star ship explorers, those that if you've ever seen Star Trek will know are highly expendable and very likely to die if they ever have the mis-fortune to be ordered on an away mission. Almost every away mission seems to hold untold dangers and lethal encounters with alien forces. Ensign Andrew Dahl is one such unfortunate wearer of crimson and has just been assigned to a prestigious posting on the flagship of the fleet, the Intrepid. He quickly twigs that there is something very wrong going on, that just about every mission ends in someone being killed and yet the Captain, chief science officer and dashing Lieutenant Kerensky always survive. As a result below decks there is always a desperate scramble to avoid being placed on an away mission, knowing that if you do you are unlikely to return. After comparing notes with other crew members Ensign Dahl begins to put two and two together and makes a startling realisation about the Starship Intrepid and just what is going on. Redshirts is an incredibly inviting read that manages to ask some big questions in an off-the-wall manner and with such effortless charisma that reading the book is a real joy. It's a pretty fast read too, I managed to consume the whole thing in two sittings. It is one of those you just can't let go until you have finished it, demanding your undivided attention. There is a great deal of humor within the story and the many running jokes about science fiction TV series, the book does a great job of examining the average series and takes it apart bit by bit. For all the humour though there is an incredible amount of depth to the whole thing, a story that asks some pretty big questions including that existentialist argument - why are we here, what is the purpose of life and are we fixed on a path by an exterior influence or do we really control our own destiny? As such the book can be enjoyed on a number of levels; for the simple pleasure of the genuinely amusing humour, (which is set just right) nods to science fiction (of which there are many) and inventive if a little crazy plot (another homage to sci-fi series plots). Alternatively you can dive into layer after layer of meaning and look at the bigger questions. If you have ever been a fan of Star Trek (any of the series or films) then you will love this on any of the many levels - even if you aren't but have seen a few episodes you can relate to much of the story. The characters are entertaining and the pace is set just right. The story is ultimately rewarding and there is even a 3 part "Coda" at the end with each part from a different perspective - both in terms of character and viewpoint. In my opinion there is a serious lack of humour in science fiction (especially since Douglas Adams passed away) and Redshirts manages to help fill that gap while still entertaining some very serious ideas. 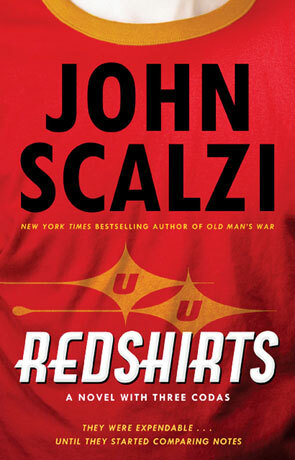 Consummately written and massively entertaining, Redshirts is an outstanding novel. Written on 14th December 2012 by Ant.